Vasthu Shastra for Living |Drawing | Hall | Family Room | Guests Sitting Area : Living room is also known as hall, sitting room, main room, drawing room etc some says it as family room also, but it may not be correct. This living room plays a significant role in vastu shastra when residents uses more of it, because now a days we are making this room as T.V watching room., previously most of taking food by sitting in dining room only, but many residents now taking food only in living room by watching Television programs. We are now accustomed for it, we are shouting our children not to watch the TV programs while taking food, but we are not following. TV/TeleVision Placements:Elders has to follow the principles, then automatically children/kids will follow. This Vastu Website author Suresh house, he is giving permission to his kids to watch Television only for 2 hours that to only on Sunday or weekly holidays. He never accepts his kids to watch TV regularly. While in holidays he accepts to watch TV for 3 to 4 hours that to discovery channel or information channels etc. He don't permit them to watch the entertainment (matter came from www.SubhaVaastu.com) channels. With parents observation he accepts any Tele Vision channel in his Home. After continuing this method now kids don't likes to watch Television in his home. He bought lots of books, trained his kids to read the books instead of watching the TV, maintaining standards only for the sake of utilizing the time for real purposes and maintaining good relations in between family members. Goes on watching television, how our relation with our family members increases, concentration on television channels continuously and there after family relations became poor. Most of the houses the residents are gathered only in living room. In other countries living room means its only for outside people sitting area. Most of the western countries there should be family rooms where all the family members are gathered and seated and discussed on their regular activities. In USA, UK and other countries also kids likes to watch the Tele Visions, but elders prefer them to read the books. Books reading is one of the excellent thought to develop knowledge. Watching Tele Vision may spoils patience, family attachments, works, peace etc. 1. Watching TV means, residents has to sit and has to watch, they cannot stand and watch it. So we have to consider the sitting place, we should check the best sitting place for the residents (we understand you are looking for watching TV as per Vastu Shastra). 2. Place the TV at East wall, so residents will sit at West direction area and they can have more open space towards East. More open space towards East always brings knowledge, name, fame, education, etc etc. In the home the more open space towards East means say about 10 feet (ex: 4 meters) or 20 feet(ex: 7 meters) etc, some homes has more than this space. More open space towards East is always auspicious. 3. Place the TV towards North direction, to watch Tele Vision residents has to sit towards South direction, this could bring money, health etc. Some homes has very huge family rooms/hall/living rooms, for them this more open space towards North is benevolent. 4. Place TV towards Northeast is another idea where homes are not aligned or tilted or skewed. To watch Television residents has to sit towards Southwest. This is one of the best placement of sitting area in such rooms, sitting towards Southwest brings, security in life, standard, luck, victory etc. 5. Placing TV towards West is not recommended, but some Home has such a setting that placing Television towards West and keeping the furniture near to that TV and may has huge open space towards East, then this system is also good to keep TV towards West direction. 6. Keeping TV towards South direction is also not recommended, but some homes has such a facility to have the sofa sets to be arranged near to the TV areas and has good open space towards North, in such case, South placement of TV is also not a wrong idea. 7. Keeping Television towards Southwest is not recommended. If so residents has to sit towards Northeast, this may brings unfortunate events in life, don't worry, if there is more open space towards Northeast then its effects will waive off. 8. Keeping Television towards Southeast and Northwest directions also not recommended, but in many homes people kept them towards Southeast and Northwest directions. Though this placement is not such good, but this placement is not such a dangerous as Southwest placement of TV. Always better to place the sitting or living room only at Northeast corner of the house, some times when the house is west facing or South facing then the living room construction at Northeast corner may not be possible, in those cases follow some tricks to get good results as shown below. 1. At our residence the maximum time has to be spent only in our "bed room" the next high time spent at "living room". We should take care of this living room in our home. We should not neglect on this living room. 2. The living room is particularly used for discussions with family members and with outsiders, most of our pecuniary matters, financial, entertaining other things are also settled at living room, so it has specific interest and importance as per vastu shastra. 3. The owner of the house has to sit at Southwest part of this living room and has to face towards East or North directions only. The other family members has to sit facing towards East or West, the outsiders has to sit in front of the owner, their faces may be towards West or South. This is the ideal place of sitting in living room. No need to worry regarding South or West facing homes, there is also a great opportunity to have living room towards Northeast, if you wish then it became true, if you are not taken care of your property nobody can take care of it. If you have more interest then automatically everybody can gathered and amend many things there, finally it became luck to your family. 4. At East facing house or North Facing House, there is one good quality point in this living room as the members of the house or owner of the house has to sit at living room (here the living room should placed at Northeast / Eshan / Ishan corner of the house only), then the good vibrations from Eshan (Northeast) corner has spread and will get the same vibrations from East side and (matter came from www.SubhaVaastu.com) North sides, these vibrations are more effective to the family members of the house. Many inhabitants are doing a great mistake that they them self doing the corrections by reading some vastu books or vastu websites and start doing corrections to their property, this is not at all recommended, its best to approach only one expert vastu specialist to get right suggestions. 5. The owner of the house has to sit towards Southwest (Nairuthi), facing towards East, if fails the next best option is Southwest-south facing towards North, you may put this lengthy sofa towards West side, and transfer the sofa chairs towards South side, the owner has to occupy at the Nairuthi (southwest) corner placement always. The guests occupies the remaining chairs. Or bread winner has to occupy the chair which was at Southwest and others may sits at South etc. If an expert vastu consultant has visited your property then you will get most (matter came from www.SubhaVaastu.com) important alteration suggestions by him. Unfortunately some residents never call Vastu Expert to their homes and them self start doing corrections an losing money and valuable time. Its only because of bad vastu in their homes. 6. Resident can put telephone at South or at West side walls so that you can easily handle the phone, pity is now many houses does not have telephones, many has only cellphones or mobile phones in their hands. Previous days if we call to other town or village we have to go telephone exchange and order for the trunk booking, we have to wait for one hour or some times it may takes 3 hours also, the lines are too disturbance and speak loudly to reach our voice to other parties. Now we may call even to foreign countries within seconds. Thanks to Late Sri. P V Narasimha Rao, technicians, Engineers, technology etc. You may keep your mobile phone where ever is possible in your living room. No need to check vastu to keep cell phones in our home. Only in some houses some Vastu Specialist are providing some recommendations after observing the property, but these are not applicable to all homes. 7. If the living room is at Eshan (Northeast corner) the flooring of the living room is lower than the entire house, it may provides very good effects to the entire family. 8. Most of the houses the front room may be the living room, and most of the living rooms are wide and larger than all the rooms at house, well here vastu works in a hidden method, if at one East facing house there might be living room is the front room, its correct method and giving good results to the residents. In some homes the starting room may be keeping waste materials and after that only living room came. This may not be the wrong, but we should not keep waste materials at first room, this is purely a mistake. Instead of keeping the waste materials in the first room you may plan a store room and keep them all in that store room, this is ideal thought. 9. North facing house residents also receives good results by putting living room at front side i.e., living room is at Northeast part. But where as it should not happen at West side facing houses and South side facing houses. 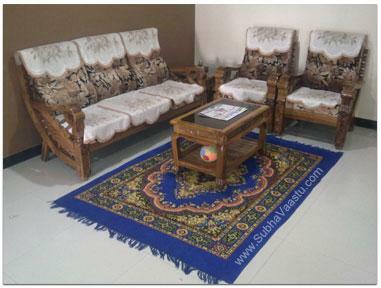 Here the residents must take most precautionary (matter came from www.SubhaVaastu.com) methods by setting the living room as the first room where is at before the entrance. Don’t construct the living room as front room at west side houses and South side houses, if you want to construct the living room at front side then consult a good Vaastu practitioner for best suggestions. What our meaning is if you are planning to make the first room as a living room for South and West facing homes, then the Southwest part may be the living room and after that the other rooms are occupying, if so what about your bedrooms, you are well known that Southwest is the best part for the Bedroom. If you have two storey building then you may happily plan living room at starting of the house. No need to worry at all then. 10. You can keep number of doors to the living room, but all the doors should be at correct places as per vastu shastra principles. You are aware that “doors” plays an very important role at house as per vastu shastra. Once again remember living room got 2nd rank at house after Bedroom as per vastu, in general, living room got 1st rank as per our living style. 11. Decorate as much as you can, but importance may be given to Vaasthu, then only you enjoy the life with your family members, otherwise you are striving for your livelihood that will be the entertainment to your neighbors and your enemies. 12. Becareful while you sitting at the living room for discussions about different category business deals. As you are owner of the house, you have to sit at the chair or sofa set, your face should be towards East or North, and guests, panchayatdhars, litigants, partners should sit and their face should be towards South or West, this type of sitting may leads victory on your discussions, finally you will get success on Panchayats (Litigation). If we require success we have to search all ways to get victory. 13. In case the house is West facing or South facing, here the living room may be at eshan (Northeast) corner but we cannot entertain every body to welcome them to sit at living room, because it may be disturbance to our family members, then consult one vastu expert, get advise from him and enjoy. 14. Finally the most important and repeated point is that you have to build the living room according to vastu shastra to lead a joyful, successful life, don't give importance to the vastu consultant fees, but better to consult only an experienced vastu consultant, otherwise you may be the victim of quacks. Usually the quacks are searching for the people, who are in need of or searching support from an vastu adviser (vastu consultant). Try to find out an expert vastu specialist and show all of your properties and live peacefully. 15. Play music continuously at this room, this is also one of the good idea. Negative powers don't like instrumental music. So switch on instrumental music. Loop music is recommended. 16. Floor levels also plays a vital role in vastu shastra. Only the best expert Vastu Pandit can explain this system, he can guide you the best methods. 1. Hanging the Wall clock towards East direction is the good idea. 2. Positioning the Wall clock towards North direction is a wise thought, it attracts money, wealth, happiness. 3. Keeping the Wall Clock at West direction may not be the right choice, if there is no any place towards East or North then resident may choose to hang wall clock towards West direction. 4. Some residents buying pendulum wall clocks or pendulum Stand clocks. Keeping Pendulum wall clocks towards East direction extends happiness. 5. Avoid hanging wall clocks towards South direction Wall. 6. Some residents hanging the wall clocks out side of the home, this is wrong action. 7. Don't hang wall clocks on the above of any door. The wall clock should be kept only on the Wall, not the above of any door. 8. East wall clock is good, but it should not be visible from Northwest bedroom or Northwest room. Please note that this rule applies only when there is a Southeast-south door for the Northwest room. Otherwise this rule never applicable. 9. If resident found any clock was stopped, then immediately he has to change the batteries / cell. Stop Wall clock is not good in any room. Keeping non-working wall clocks in the home is bad idea. 10. Broken glass wall clock should be changed immediately. One should take immediate action when they found that the wall clock glass was broken. 11. All clocks in the home should show correct time, showing wrong time in different clocks is not good idea. Keep correct time in all the clocks in the home or office or business concern. 12. Most of the wall clocks now showing some scenery or photos etc. Better to buy only the good scenery or kids laughing photo wall clocks or mark happiness clocks are good to buy, one should not buy the wall clocks which shows negative energies like loneliness, War, sadness, grief, heart broken, sorrowful, melancholy, dismal etc. Showing happiness images on the clocks are good, or buy only the plain color clocks. 13. Try to always clean the wall clocks. Weekly/monthly cleaning the clock glass and front and backside is good, it took only 2/3 minutes. 14. Placing the wall clock at Dining room is not good idea, better to place the wall clock at Living room or family room. 15. In bedroom many residents are keeping the wall clocks, for them first we should check where their head is coming on the bed, if their head is coming on South direction then the first preference to keep the wall clock towards North or East direction, further please note that if there is a appropriate place towards Northeast then one may place the wall clock at Northeast too. If head came towards East in the bedroom while sleeping then hand the wall clock at North wall or second best is East wall. 16. In vastu shastra everything is important to follow, because house is the only subject which predicts the life of the residents, once residents are giving more importance to their success and victory then they may follow this kind of small Vastu Tips. In particular the living room should be spotlessly clean. This is the replica of the general maintainance of the home. Is Flats in Apartments are also come under vastu shastra view? How to get in touch with best vastu specialist through this website? Folks says that South facing properties are not auspicious, is it be true? Is vastu shastra provides a route to have good development in our own life? Where to locate our office boss or chairman chamber inside of our workplace? My friend is going to buy one property, is it compulsory to check that property vastu? In our village, some elders says that three stories building is not good as per vastu shastra? Some elders says that if crow enters straight into house, should certainly we vacate that home? In a Master Bedroom which is the best part for the beds and which position is good for sleeping? Can we place TV opposite to windows placing in the East wall of the living room(west side wall their is main door and windows , the south side wall has windows) north side their is no wall its a small courtyard hence their is no other choice. What if I place my tv set in the west direction. Is it k or not?? ?